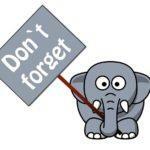 As to the background of this matter, please see the report about the main hearing on this Blog here and the discussion of the first instance decision of the FPC on this Blog here. 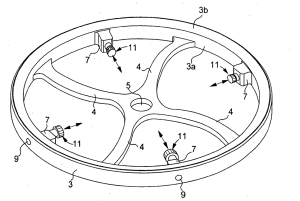 In brief, Omega had alleged infringement of its EP 1 837 719 B1; see the EPO Register and Swissreg for further bibliographic details of the patent in suit. With decision of 14 March 2018, the FPC had rejected Omega’s claim for infringement while Tudor’s / Detech’s counterclaim for invalidity had been allowed; EP(CH) 1 837 719 B1 had been declared invalid. The Supreme Court now dismissed Omega’s appeal, i.e. confirmed the FPC’s decision. EP(CH) 1 837 719 B1 is thus finally declared invalid. On appeal, Omega has argued that the FPC took an unrealistic piece of prior art into account in the assessment of inventive step. Indeed, the FPC had considered a document that was published already about a century ago, i.e. US 759,914. In view of the evolution of watchmaking since then, Omega considered it unrealistic that such a document was actually considered as a starting point in the assessment of inventive step. Consequently, Omega alleged a violation of Art. 56 EPC. The Supreme Court did not buy this argument. It is held in no uncertain terms that everything that had been made publicly available — including old documents — forms part of the prior art. One cannot exclude a document from consideration in the assessment of inventive step just because of its age; see ¶3.1.3. Écarter un document de ceux que consulterait l’homme de métier en raison de son ancienneté reviendrait à priver les brevets ayant dépasé un certain âge de toute valeur dans le cadre de l’analyse de l’effet invenif. Un telle pratique ne saurait être déduite de l’art. 65 CBE. Reference to some case-law of the Boards of Appeal of the EPO did not help either: The mere age of a document has not been decisive in T 479/00, T 366/89, T 1000/92 and T 334/92. The Supreme Court notes that the obsolescence or outdatedness of a technology had been the key issue in these decisions, which excluded the respective documents from consideration by the skilled person. Apparently, no such case had been established by the appellant in the present matter. 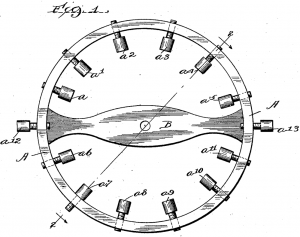 The balance wheel of US 759,914 has inertia blocks that must have been placed from the inside, as claimed by the patent in suit; see the screw head on the inner side of the felloe in the figures below. But what is still missing here is the stud (‘plot’) according according to the patent in suit. 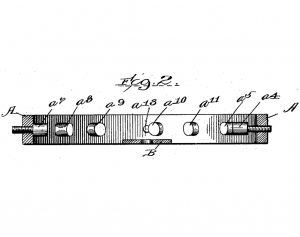 Omega argued that the skilled person would not have added studs to the balance of US 759,914 in view of the risk to impair the automatic adjustment of its temperature dependent moment of inertia, which is the sole purpose of this invention. However, the Supreme Court holds that this is not in agreement with the fact findings of the FPC, and thus did not consider this argument any further. The FPC had not explicitly motivated its choice of US 759,914 as the closest prior art in the assessment of inventive step in accordance with the problem-and-solution approach. And the Supreme Court indeed acknowledges that it would have been desirable if it had done so. Ainsi, il eût été souhaitable que la juridiction précédente détaille la première étape de l’approche problème-solution comme elle l’a fait pour les autres étapes de son examen. 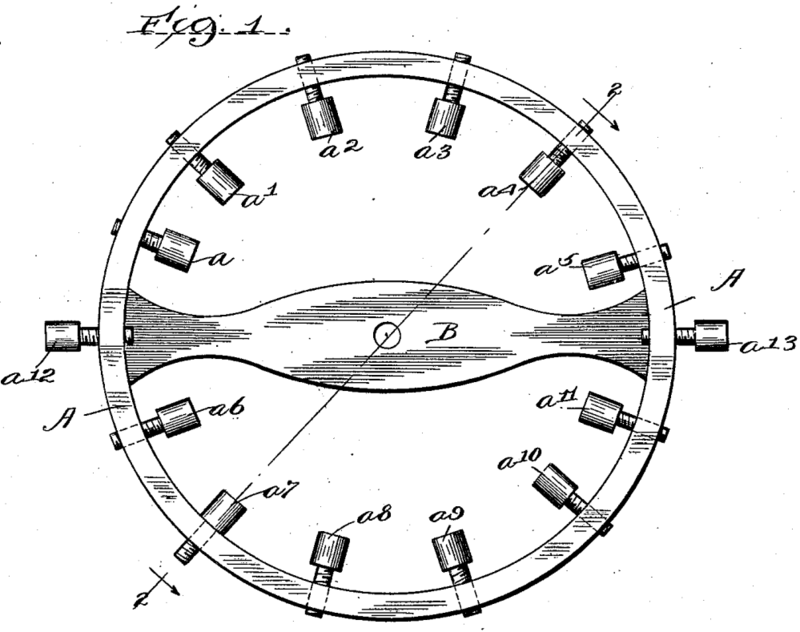 But still, in view of the FPC’s detailed discussion of how the skilled person had arrived at the invention starting from US 759,914 without inventive merit, it became sufficiently clear how close both inventions actually are, and why US’914 thus is a reasonably chosen closest prior art. Omega had filed yet another, even more limited auxiliary request (AR3) with the response to the expert opinion of the judge-rapporteur. The FPC had not admitted this request into the proceedings anymore, with reference to O2015_012. Omega had challenged this on appeal. But while this appeal has been pending, the Supreme Court ruled on the appeal against O2015_012 — and backed the practice of the FPC in this respect; decision 4A_543/2017 of 08 May 2018, see this Blog here. Accordingly, Omega did not succeed with this argument, either. In sum, Omega’s appeal was dismissed and EP(CH) 1 837 719 B1 is now finally declared invalid. We have reported on the background of this case and the main hearing on this Blog here. 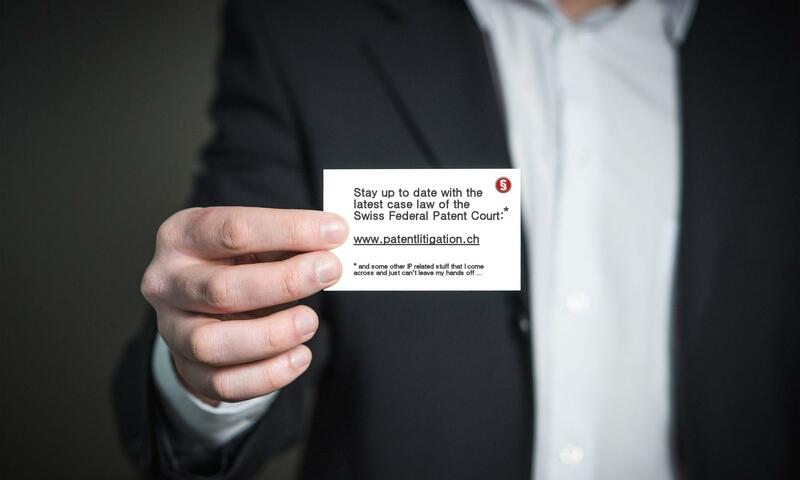 In brief, infringement of Omega‘s EP 1 837 719 B1 is at stake; see EPO Register and Swissreg for further bibliographic details. 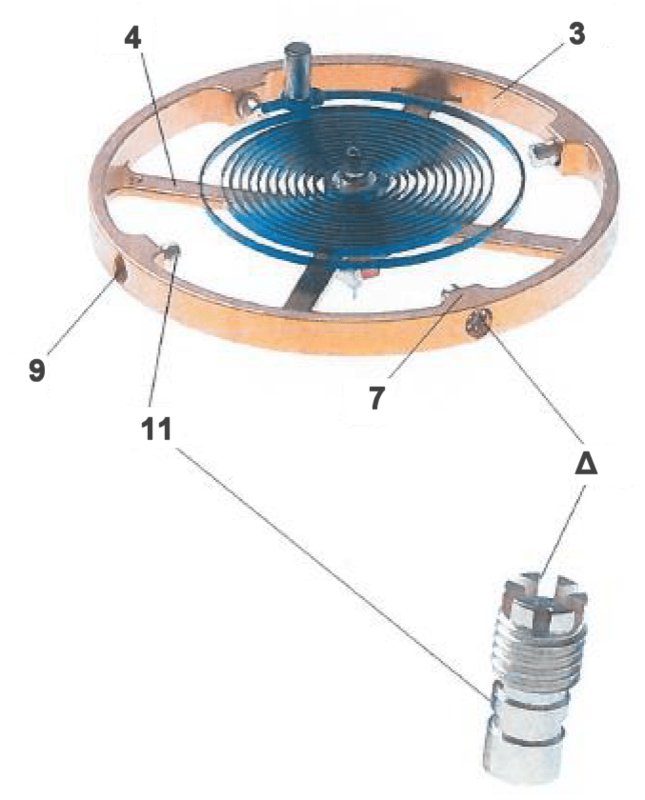 Balance for a timepiece movement including a felloe (3), arms (4) connecting the felloe (3) to the balance staff and inertia blocks (11) for adjusting the unbalance and regulating the moment of inertia, characterized in that the felloe (3) includes studs (7) directed inwards, a threaded hole (9) into which said inertia blocks (11) are screwed from the inside, passing through said felloe (3) and said studs (7). The attacked embodiments are Tudor‘s calibres MT5621 and MT5612. 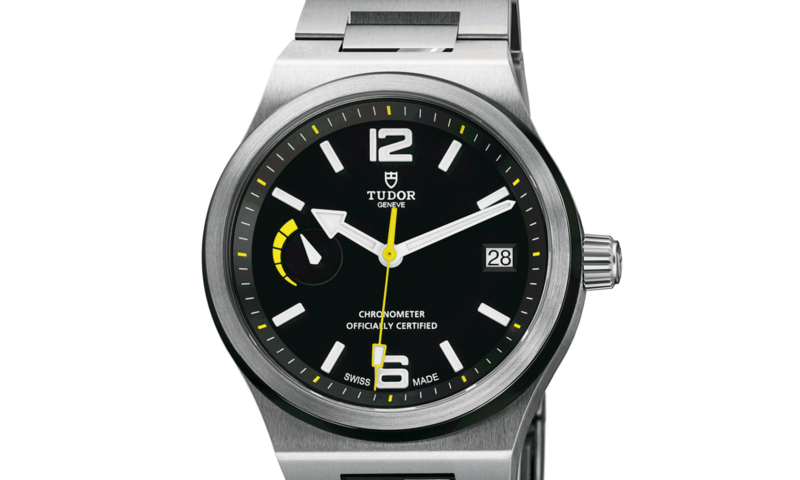 Defendants Tudor and Detech denied infringement and countersued for invalidity. Let’s get to the details now, at least to some extent. The decision is a booklet of 58 pages, and I will thus only comment on what I believe are the most relevant issues of the case. 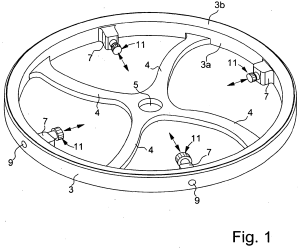 Faced with a counterclaim for invalidity, Omega defended the patent substantially as granted as the main request (MR; see the slight amendment in feature #5, below), and with two auxiliary requests (AR1 and AR2) to a more limited extent only. In the feature analysis below, claim 1 according to the MR is structured into features 1-7. Claim 1 according to AR1 comprises features 1-8, and AR2 comprises features 1-9, respectively. 1 Note that ‘radialement’ / ‘radially’ is not included in claim 1 as granted. 2 Additional feature of claim 1 in AR1 vis-à-vis the MR.
3 Additional feature of claim 1 in AR2 vis-à-vis AR1. Omega’s requests for injunctive relief are adapted accordingly in MR, AR1 and AR2, to conform with the respective requests to maintain the patent. The requests for injunctive relief additionally refer to an illustration of the attacked embodiment that is reproduced below. 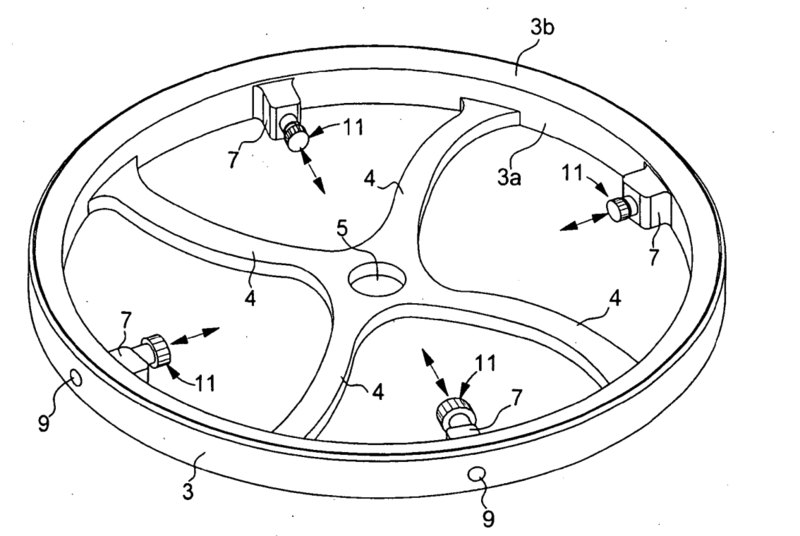 However, I have amended the reference numbers in accordance with those used in the patent. les masselottes sont vissées depuis l’intérieur? Does it only require that the inertia blocks can be adjusted from the inside, irrespective of how / from which direction they had been initially placed in the hole, i.e. from the inside or outside of the felloe? 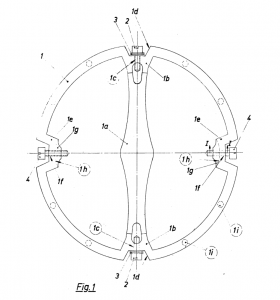 Or is it mandatory that the inertia blocks at least could have been placed in the hole from inside of the felloe? 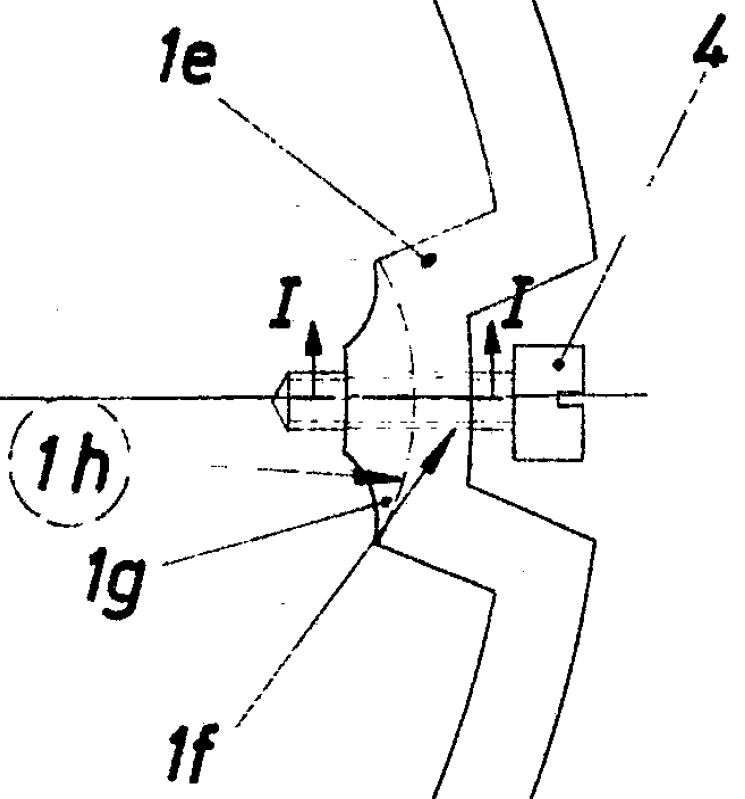 Note that EP’719 only discloses inertia blocks with heads (13) that cannot go through the hole, i.e. they must be / have been placed from inside of the felloe; see e.g. ¶. Anyway, I leave this tricky linguistic question to the francophones to decide for themselves. The decision holds that this feature #7 only requires that the inertia blocks could have been inserted and screwed from the inside during the assembly of the balance wheel (by an access between the serge and the centre of the serge) in the hole traversing the stud and the felloe. 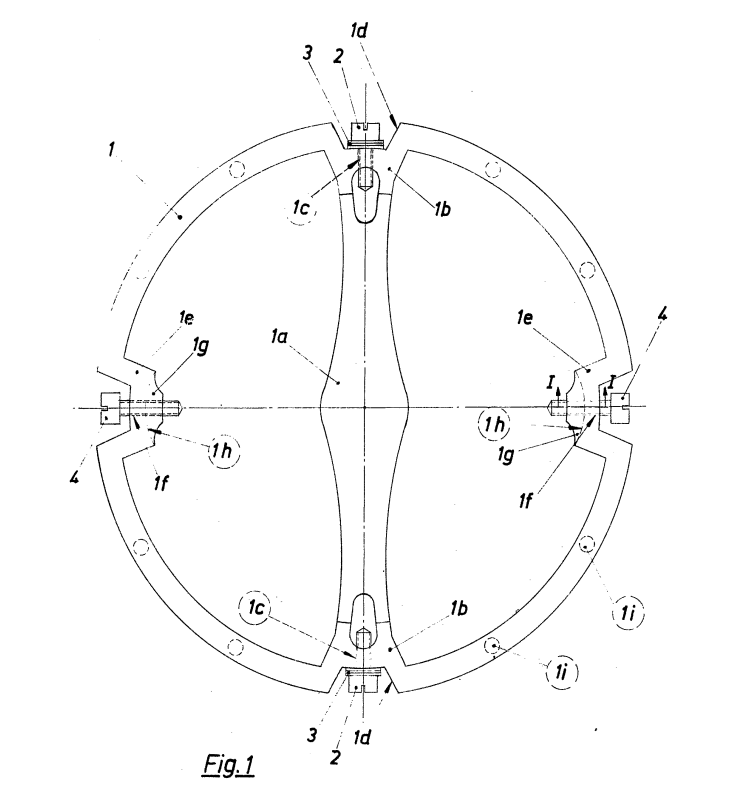 Consequently, feature #7 does not cover inertia blocks which, already present in the tapped holes of the serge and the studs, can be screwed from the inside for the purpose of adjusting the inertia and unbalance, but which would not have previously been inserted and screwed into the corresponding hole from the inside of the felloe. The balance wheel in DE 864 827 comprises a stud (‘plot’) in the sense of feature #5; see the section 1g in the figures below . But since the screws with the inertia blocks have a head on the outside of the felloe, they do not meet the definition of feature #7 as construed above. Novelty over DE 864 827 was thus acknowledged. On the other hand, the balance wheel of US 759,914 has inertia blocks must have been placed from the inside; see the screw head on the inner side of the felloe in the figures below. But what is missing here is the stud (‘plot’) according to feature #5. Thus, novelty was acknowledged over US 759,914. 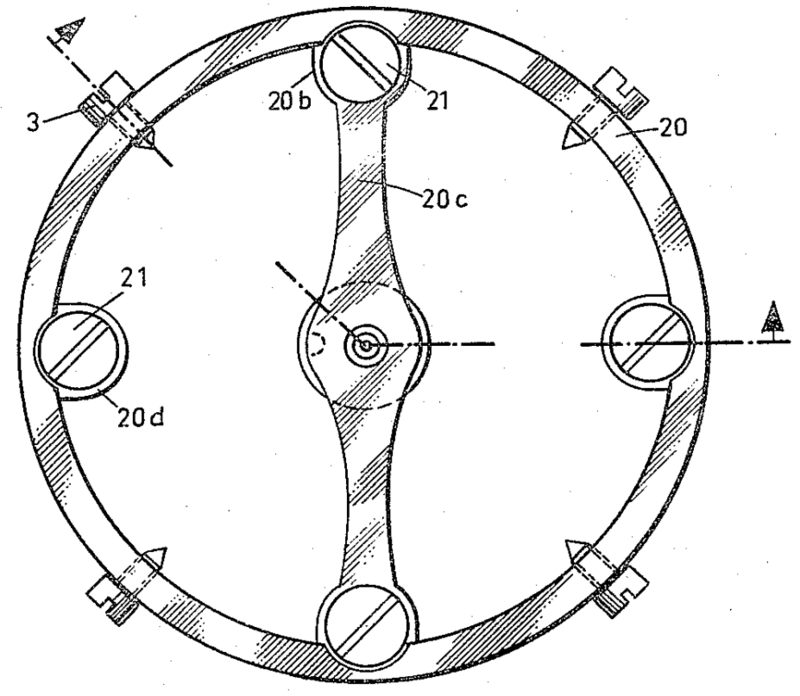 The balance wheel of US 2,958,997 has some axial screws (21) which are not inertia blocks. 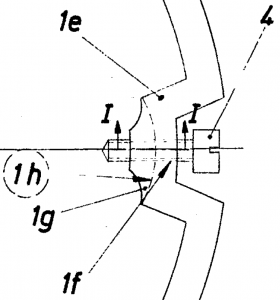 On the other hand, it is not possible that the inertia blocks (3) have been placed from the inside since the screw head is outside of the felloe. Features #6 and #7 were not considered anticipated, and novelty was thus acknowledged. Here, the studs are arranged axially on top of the felloe. The hole thus only passes through the stud, not through the felloe. Features #6 and #7 were not considered anticipated, and novelty was thus acknowledged. Inventive step has been assessed on the basis of US 759,914 as closest prior art; see figures above. The distinguishing features are #6 and #7, i.e. the studs (which are directed inwards), and the inertia blocks arrangeable in a hole through the stud (and the felloe) from the inside. 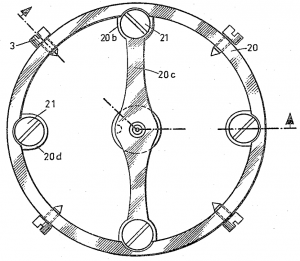 Increasing the diameter of a balance wheel without modifying its inertia. Petite pièce métallique, généralement cylindrique qui sert de butée ou qui renforce la partie d’une pièce qui doit recevoir une goupille ou une vis. Small metal part, usually cylindrical, used as a stop or as a means of strengthening a part that takes a pin or screw. It is held in the decision that, with this skilled person’s knowledge in mind, it was obvious to arrange studs on the felloe to reinforce the holes. But on which side? On the inside or the outside of the felloe? When placed on the inside, the diameter of the felloe can be larger. Anyway, with reference to T107/02 and T739/08, it is held that a choice from a very limited number of alternatives without an unexpected effect cannot be considered inventive. The auxiliary requests did not succeed, either. As to AR1, the inertia blocks can be moved independently of each other already in US 759,914. As to AR2, the felloe has an external surface of constant diameter all around its circumference already in US 759,914. Omega had filed yet another, even more limited auxiliary request (AR3) with the response to the expert opinion of the judge-rapporteur. This request was not admitted into the proceedings anymore, with reference to O2015_012. In particular, the decision holds that the expert opinion did not contain new facts or arguments of a technical nature which had not been argued by the parties. 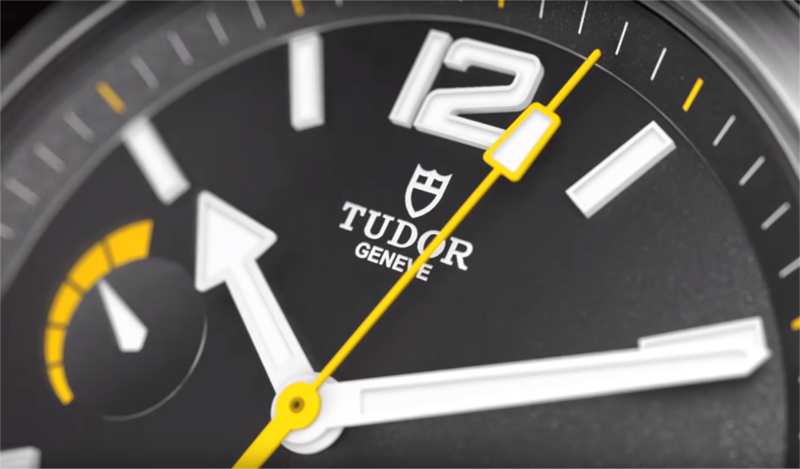 Omega’s claim for infringement has been rejected, Tudor’s / Detech’s counterclaim for invalidity has been allowed and EP(CH) 1 837 719 B1 declared invalid. The decision can still be appealed to the Supreme Court. The appeal has been dismissed by the Supreme Court (4A_282/2018; reasons not yet available). The main hearing in this matter took place earlier today. See this Blog here for a brief review of the subject-matter at stake, based on the court’s detailed announcement of the hearing. 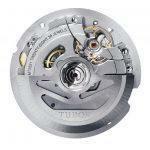 Infringement of Omega‘s EP 1 837 719 B1 is at stake; see EPO Register and Swissreg for further bibliographic details. Interestingly, the balance wheels looked a little different when the calibre had been introduced back in 2015 at Baselworld; see here. Do you notice the different balance wheel in the top right of the calibre? 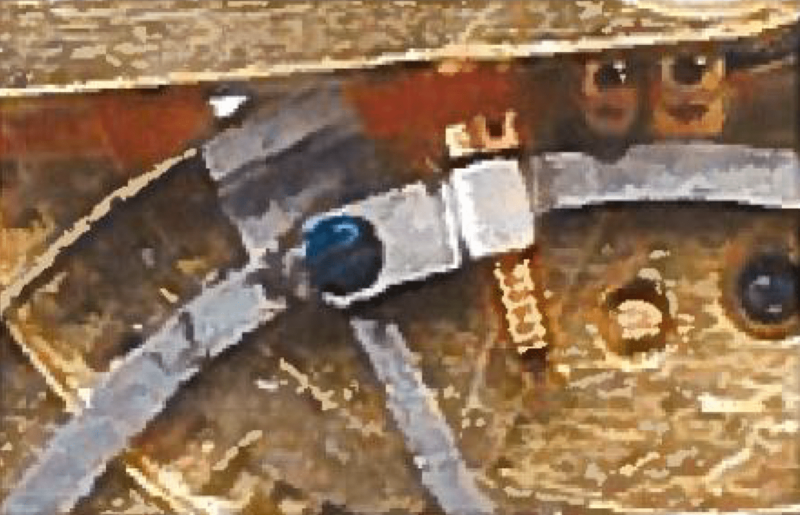 We have found a perspective picture of the old MT5612 balance wheel on the internet here; a similar picture had been shown in the hearing. 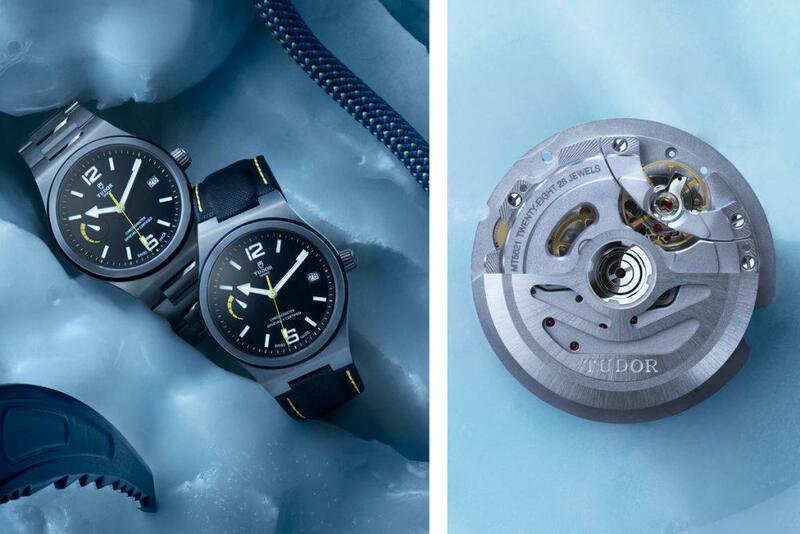 When digging a bit deeper, we came across a report in a watch Blog suggesting that the change of the balance wheel had apparently been implemented in view of Omega’s intervention at Baselworld 2015. Indeed, that would be a perfect fit with the case number of the present matter referring back to 2015. Now, about three years later, the case surfaces again. 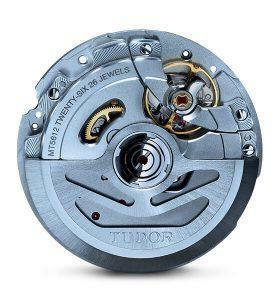 Defendants Tudor and Detech deny infringement under the DoE and countersued for invalidity in view of DE 864 827, US 759,914, US 2,958,997, ROLEX calibres and the common general knowledge of the skilled person. Based on what can be concluded from the pleadings, plaintiff is on the defensive. The expert opinion of the judge-rapporteur had apparently held that the claimed subject-matter (to the extent invoked) was novel, but not inventive. However, the judge-rapporteur had not yet assessed infringement in his expert opinion. […] inertia blocks (11) are screwed into a threaded hole (9) from the inside […]. Evidently, the parties disagree on whether or not this feature is fulfilled in the attacked embodiment(s). Is it sufficient for infringement to be ruled out if the inertia blocks are screwed into the threaded hole from the outside? It remains to bee seen whether fixation from the outside might constitute infringement under the DoE. 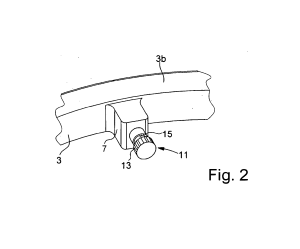 In particular, plaintiff argued that there was no indication whatsoever in the patent in suit that the direction of fixation was of any relevance. Guess which way the wind is blowing: Pemetrexed. The final judgment needs to be awaited, to fully understand how the inertia blocks in the attacked embodiments are actually fixed. The value in dispute is CHF 1M. The parties did not enter into settlement discussions today. Omega ./. Tudor et al. : The next decision on the DoE approaching? The FPC today published an announcement of the main hearing in this matter. 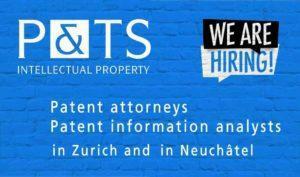 Infringement of Omega‘s EP 1 837 719 B1 is at stake; see EPO Register and Swissreg for further bibliographic details. The attacked embodiments are Tudor‘s calibres MT5621 and MT5612; infringement under the Doctrine of Equivalents is alleged. 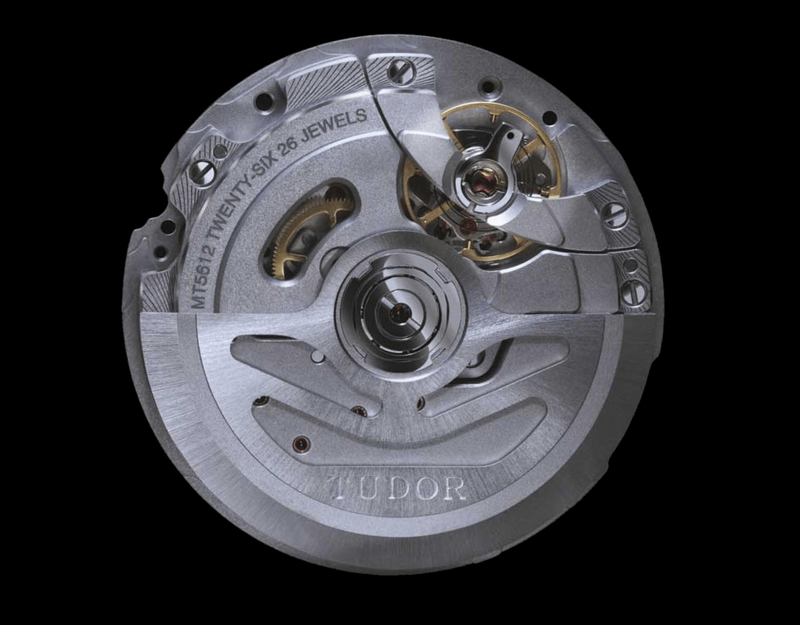 Defendants Tudor and Detech deny infringement under the DoE and countersued for invalidity in view of DE 864 827, US 759,914, US 2,958,997, ROLEX calibres and the common general knowledge of the skilled person.